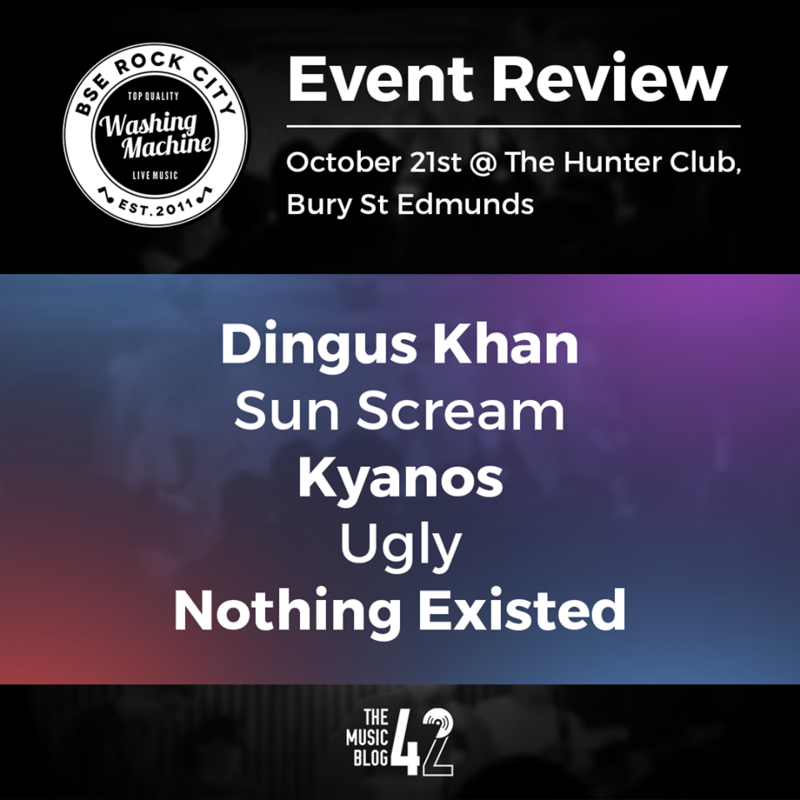 Another Saturday, another Washing Machine at The Hunter Club, and tonight was the long-anticipated live return from Manningtree’s finest Dingus Khan. Before the main event, four excellent bands entertained the ever-growing crowd. Colchester’s Nothing. Existed. were up next, however due to transport issues and miscellanous reasons, I unfortunately missed their set apart from their last track. A very different sound to what I and many others have heard at a Washing Machine gig, but ultimately a very fresh and great way to open what was bound to be a superb night of live music. These are definitely a group you need to see to believe, and I for one will definitely go and see these again. Ugly delighted crowds with their cheeky brand of alternative-indie. The overwhelming highlight of their riff-packed set was the superbly-named The Last Supper At The Regal Wetherspoons, a song dedicated to Cambridge’s Wetherspoons and ‘how atrocious it is’, I wholeheartedly agree with this statement. But anyway, a great set from a band who haven’t performed in Bury for a long long time, and hopefully they’ll be back sooner this time. Another band who haven’t perfomed at The Hunter Club for quite a while are the incredible Kyanos. They stunned the packed-out venue with their psychedelic sounds. They played tracks from their recently released EP Elevator To Japan, alongside another yet-to-be-released new track So High, which sounds so so good and could easily be their best song yet. A big set from one of the rising talents on the Bury music scene. The roaring Dingus Khan closed proceedings with their anthemic headline set and my god, it’s been a long time coming, hasn’t it? Having been away for a few years, they sounded better than ever belting out their most popular tracks like Ambulance and Plank, with some stunning dance moves to boot. Milk From Every Mammal as ever sounds even better live than on the studio version. The band unfortunately weren’t allowed to use their ever-present giant inflatable swan, however that didn’t detract from their epic hour-long set. Another great track Knifey Spoony was ultimately the highlight from such a great set. Dingus Khan are well and truly back, and with their new album out in two weeks (they said that their album was delayed because of the new £1 and £5 currency change! ), it’s getting better and better for the band. Please remember to ignore the giant swan in the corner. The next Washing Machine is Saturday 4th November! Featuring the first headline set from SIAH, and the last ever gig from The Virtues!